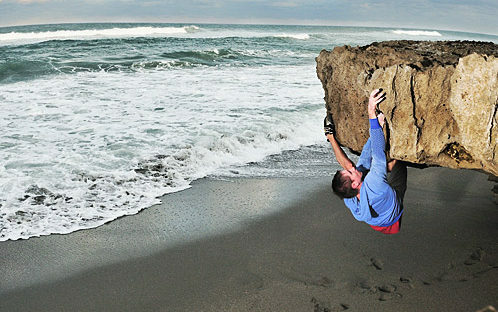 Beach Bouldering in South Florida? – It Exists! Whenever I’m out at a crag up north and am asked by fellow climbers where I’m from, the answer “Florida” always gets sympathetic looks and mumblings about how it must be rough to live without easily accessible climbing. 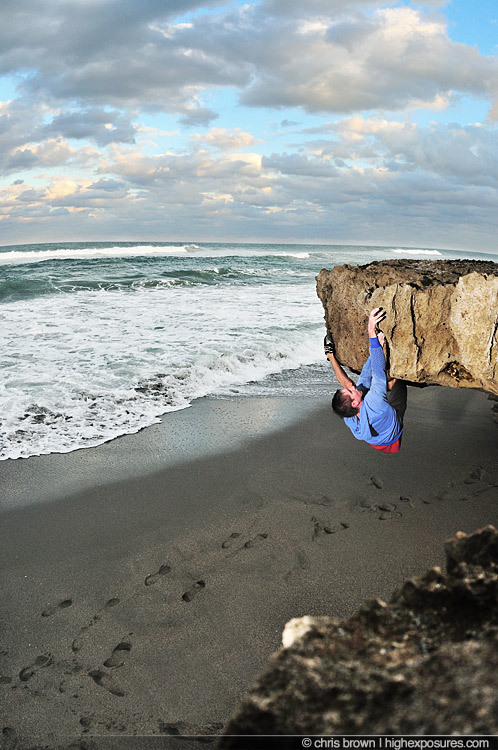 Well, according to Dead Point Magazine and the legendary Chris Brown of Vertical Ventures – beach bouldering isn’t just a myth in south Florida. Avid climbers can enjoy outdoor Floridian climbing at the Blowing Rocks Preserve, located a little more than an hour north of Miami. Naturally, there’s a catch – a pretty big one at that. Not only are the rangers in this area known for chasing off climbers, the crag is dangerous and extremely time-sensitive. Climbing at Blowing Rocks is entirely dependent on the tides; you must get there before the tide begins to rise. Another issue? Sand levels. The exposed rock formations are frequently covered up by thick dunes of sand that make it impossible to reach routes – which are allegedly rated up to V12! As a Miami native, I feel it is my civil duty to check this place out and give it a shot. Plus, this would make for a sweet photoshoot, as Chris Brown has already proven on his HighExposures blog. Enjoy, Florida kids! Coffee cake muffins, climbing and Masa are on the agenda – must be Valentine’s Day! I was telling a friend about Blowing Rocks today!!! Do you remember going there when we camped out at Jonathan Dickinson? No! Ugh, I can never remember any of the awesome stuff I did as a kid – so frustrating! Like the modern look. I really enjoyed this article. Many thanks for this useful blog post. Get back on your camera! I miss following your photographic endeavors. Sir, yes, sir! You’ll have to excuse me for not keeping you entertained, but I’m workin’ on a little project with a few friends that I think you’re really going to be blown away by, and become obsessed with. 🙂 Stay tuned within the next month for some really awesome things to explode! Yeah, you just made my day. Thank you. While on @TheMostEpicTrip, we were climbing all over North America. 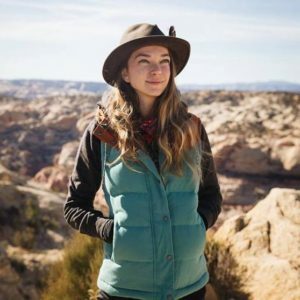 I am from FL originally with family still there and we thought there must be SOMEWHERE to climb there, but the only thing we could find after searching was crumbling rock that was completely unsafe. We searched websites, asked around… everything. Wow. I wish we knew you at the time! Haha, that shot look amazing. Pretty sure he’s working out his feet as well. After all they do carry the entire weight of our bodies when bouldering (at least on vertical climbs). I’ve noticed the guys who work their feet out climb pretty effortlessly. Especially considering they’re keeping everything else in tip top shape. If you guys want to know more about strengthening your feet, give my blog a try : https://www.thesewisefeet.com/how-to-fix-flat-feet/.